What's a girl to do? Finding someone I really like is such a challenge. Sure, I've been to other dating sites, but none of them were right for me. You should have seen my other date? Am I the best? Ever? Huh? I'm the human jackpot. Hey sweetheart... feel like God just gave you a gift? Yeah, I know. I know it's our first date, but will you marry me? (looking at camera) I am so not ready for that. What's a girl to do? I felt the same thing too, until I joined SexySinglesDate.com. They have personality matching; audio/video profiles, and live Web cam. So what you see is really what you get. Finally, a site that's got all the options you'd expect on a social site with the kind of activity of a dating site. It's really giving you a chance to meet someone you can vibe with. I mean, I get the maximum experience out of it; meet beautiful and interesting women I enjoy getting to know both online and off. With SexySinglesDate.com, we have the same pool and I'm staying in the know. SexySinglesDate.com - a fresh new way of dating. Join today! 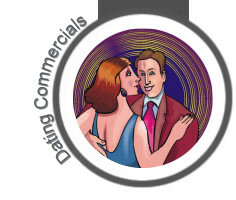 Content on Online Dating Commercials is ©Copyright 2008. All Rights Reserved. Content may not be republished. online dating tips and advice. Sign up for the Online Dating Newsletter! © 2008-2012 Online Dating Magazine.